My Gibraltar Celebrates 20 Years on the Rock. Leisure tourism and destination weddings company 'My Gibraltar' celebrated 20 years of selling Gibraltar to customers in the UK on Monday at the Sunborn Hotel. 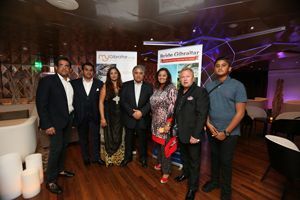 The cocktail party was attended by Minister for Employment Joe Bossano and members of the tourist industry on the Rock..
Chairman of 'My Gibraltar' and UK based company 'My Vacations', Raj Kumar said it had been a lovely journey so far supporting Gibraltar over the last 20 years. This idea started off as a little bit of a joke.Albert Poggio contacted me and it turned out to be quite a success story," he said. From 50 passengers we have grown to bringing over 20,000 passengers here with the support of all of you. Gibraltar is a beautiful community where everyone knows everyone. I really love this little Rock and I hope to have a place here someday"